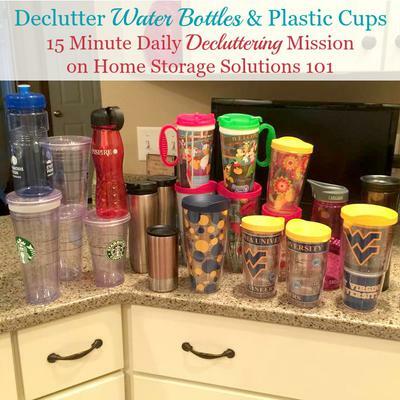 Today's mission is to declutter water bottles, travel mugs and plastic cups. This mission is designed to be done while working on the Kitchen Cabinet & Drawer Organization Challenge here on the site. When working on this mission the object is not to get rid of all of these cups and containers. After all, your family needs to keep hydrated, including outside the house. But if you're like me you might have more of these bottles and cups than you realize and could stand to get rid of some of them. It seems like my family collects water bottles left and right, always getting a new cup or water bottle at all kinds of events, especially since we're a tennis family and go to all kinds of meets and tournaments. What ends up happening is we throw the new one into the cabinet, but don't get rid of any of the older ones, and soon we're overrun, and they're spilling out of the cabinet each time we open it up. In addition, if you've got a lot of these travel mugs and cups, but not enough storage space, make sure to keep the ones that are BPA free, or stainless steel, for example, and get rid of the cheaper plastic ones. in the collage to the left). She said, "this is my collection. I will never get the value back out of some nice Contigo and Brita water bottles I am getting rid of, but my thoughts are these: no lid, bad seal, gone. Don't ever use - obviously not my faves, gone. Have to hand wash (I am blessed with a dishwasher), gone. Then I eliminated one more of every style (my least fave or in one case, my fave - but it was horribly beyond the point of keeping). I still have a good collection, but also have a young family of 6." After you've winnowed them down in that way you may still have too many, so you've got to decide how many are reasonable for you to keep. Only you can decide what is a reasonable number to keep for your family. Since we play sports in our family I need at least two per person, one in use, and one in the dishwasher getting washed for its next use. That means, for our family of five (since my husband and I both exercise each weekday, as well), we need 10 water bottles. You decide what is a reasonable number for your household based on usage and the amount of storage space you've got. Below I've gathered photos from readers who've already done this mission showing their results. 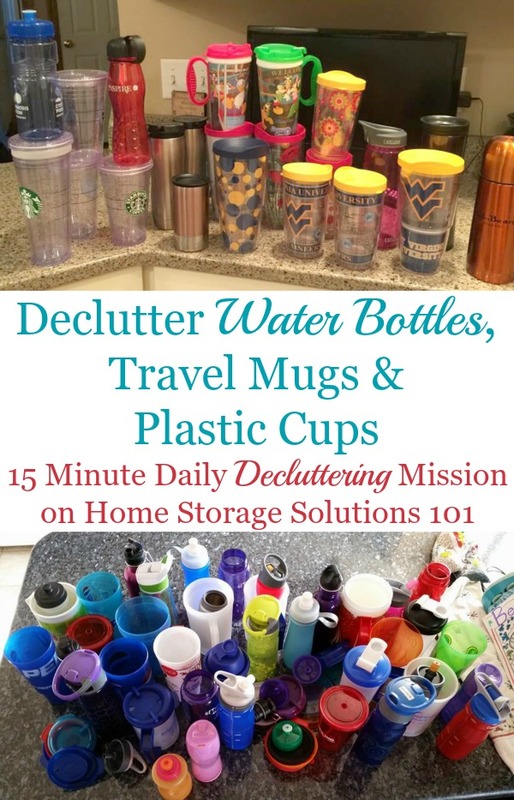 Plus, once you've got them decluttered make sure to check out the companion article with lots of water bottle and travel mug storage ideas to keep them organized in your kitchen. 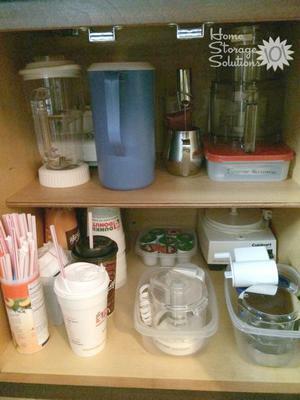 Many of us keep our water bottles and travel mugs in a kitchen cabinet, and one of the ways you'll know you need to do this mission is if, when you open your cabinet, you are concerned some of these bottles might fall out. 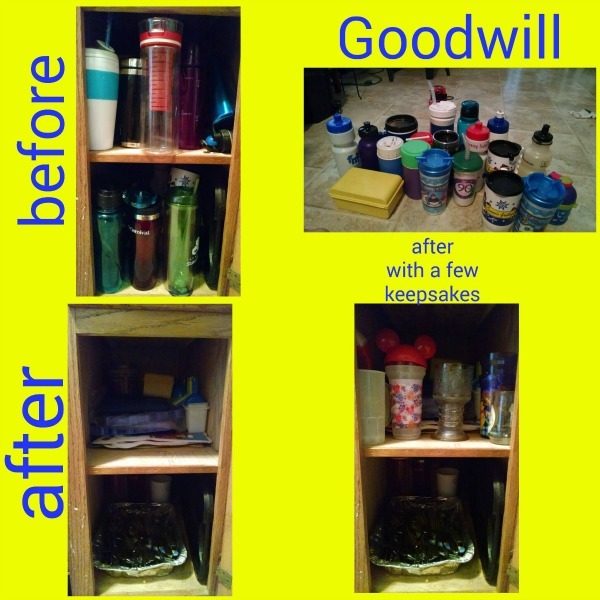 That's what happened with a reader, Stephanie, who sent in the before photo, above, showing her stuffed cabinet full. She said, "Going to tackle this now. I'm a sucker for plastics, don't know why, but it's time to clean out some." After she'd done this mission she sent in another photo, this time a collage, showing the before and after of her efforts, including the pile she was donating. There really is a difference, isn't there? As part of this mission make sure to get rid of restaurant clutter too. You don't need to hang onto every plastic cup from the fast food place, or to go cup from a restaurant. 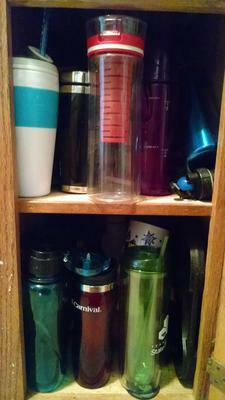 For example, a reader Jackie, showed a collection of coffee containers her husband had accumulated with time. She said, "No problem with water bottles, but coffee containers, we had too many. Now gone! There are only 2 of us!" She continued, explaining about the second photo, "cabinet much neater!!" 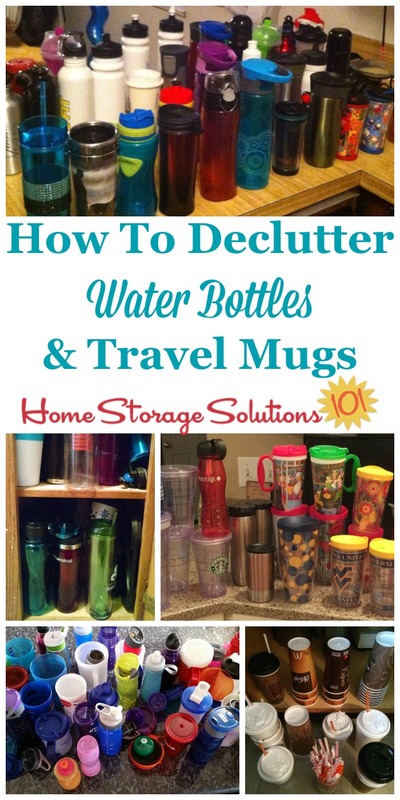 Once you've decluttered down to a more reasonable amount of travel mugs, plastic cups and sports bottles, you can check out this article with water bottle and travel mug storage and organization ideas for your kitchen. I hope seeing these pictures has inspired you to get rid of your excess sports and water bottles, travel coffee mugs and plastic cups. I think the over the door shoe holder is an awesome idea. However, you also need to ask yourself how many of those you really need to keep. 1 per person in the household seems reasonable unless your talking child sippy cups. 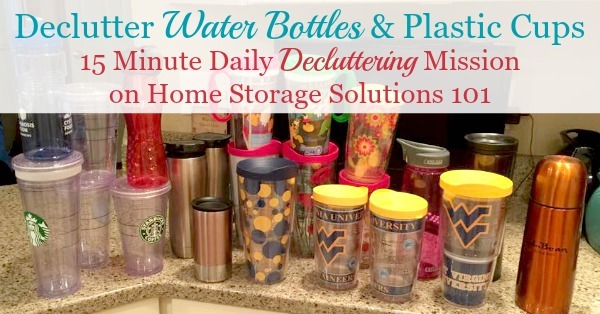 Who, other than the Duggar family, needs 20 water bottles? 1 per person should be enough. The more you purge, the less you have to store. How about get rid of half those water bottles so each person has one. Less stuff means less to worry about. BTW, the shoe rack works great for cans and bottles of stuff in the bathroom, as well, and I think it's PERFECT for all the 2 or so dozen water bottles of different shapes, sizes and purposes that we've got. Thanks so much for the great tip! Can't believe there are so many folks that feel it's their right or business to tell someone else they have too many of anything. Hello? Not yours, mind your own. We are a family of six, and we have a LOT of water bottles! I disagree with the one-per-person idea. Not that I want them everywhere, but they need to be washed from time to time -- and to me, that means dishwasher. 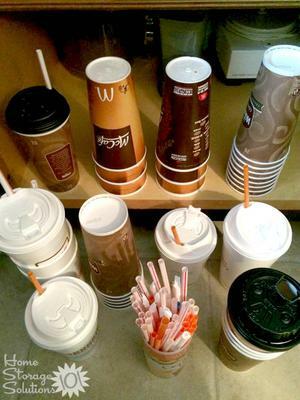 I've tried to limit to two per person plus one travel mug for hot beverages. That's still at least 18, and more usually creep in. I have plastic boxes in my lazy susan cabinet, and they stand in those quite nicely. I also have a box for lids and straws, as someone said, saves me time in matching. I decided to donate our water bottles - they were all different and finding the correct lid to the correct bottle was frustrating! Replaced them with all the same kind so any lid will do. I don't have bottles, I have Tervis mugs. 2 people live here, but often have 5 here. I have 10 plus 2 kids size. I packed my Christmas themed ones away with the Christmas decorations. I have been forbidden to buy anymore. Since I won't get rid of any, I guess I won't be buying any. first step to less clutter - refuse! Hello! Firstly, thanks a lot for your tips! Second, when I see people with so many drinking bottles, etc. I feel kind of puzzled - I just don't think anyone needs that many! (Though maybe they have a lot of children?! ) We have 2 each and so they don't really need much organising. As for getting freebies - my top tip (which comes from Bea Johnson, Zero Waste Home) - Refuse! Just say no to any freebies you don't need, and stop this unnecessary future clutter and eventual landfill from entering your house. I like the idea of just saying 'NO' to freebies but, when my husband hears free, he can't say no. Or if he finds a drink cup he likes, he buys 5 just in case they quit making that style. With some things it is a real struggle to manage. Donate these leftover extras to your closest homeless charity. The homeless - especially in the heat of summer - can use these cast offs. They can refill them with ice and water for free just about anywhere. I'm thinking if I get a new one in then one old one should go out. I tend to hang on to too many similar items, so have to limit myself, and be assertive!